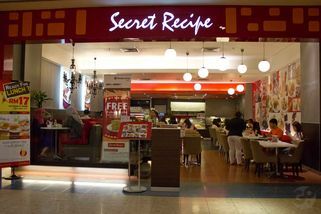 Secret Recipe Cakes and Café offers an extensive range of quality gourmet cakes and meals. 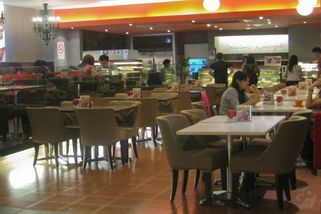 Founded in 1997, the famous chain has now evolved and leaving marks in most major cities in Asia and Australia. Incorporating both concepts of modern contemporary and vibrant interior as its main lifestyle concepts, Secret Recipe Cakes and Café provides a venue where good foods and comfort ambience comes together. The menu selection consists of starters, main courses and appetizers for a complete wholesome meal. Pick your favourite in its line of starters menu such as Seafood Spring Rolls, Deep Fried Wonton and Crispy Chicken Salad, and move towards its main courses from Asian Classic menu ( Noodle in Tom Yam Soup, Curry Mee, Thai-Styled Fried Rice, etcs. ), Chicken menu ( Grilled Black Pepper Chicken, Chicken Parmigiana, Chicken Steak Burger with Fries, etcs), and Pasta menu (Lasagne, Spaghetti Meatballs, Prawn Macaroni with Cheese, etcs). Conversely, if you are vegetarians, you may try their Arrabiata Spaghetti and Vegetarian Soba, to name a few. Famous for their cake selections for parties, birthdays, engagements or just to fulfil those sweet craving of yours, Secret Recipe Cakes and Café offers a wide selection of cakes such as Turkish Indulgence, Strawberry Marshmallow Cheese, White Dark Chocolate Cheese, Durian Cheese, Yogurt Cheese and its ever-famous, New York Cheesecake. Available in more than 50 outlets nationwide.